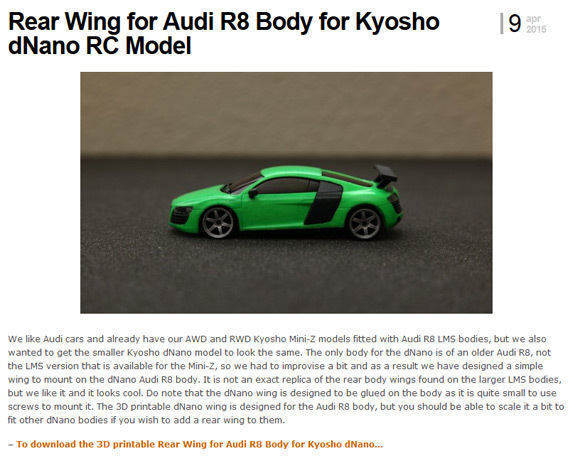 Lately we have been designing a lot of parts for small remote controlled cars such as Kysho’s dNano and Mini-Z as well as Losi’s Micro-T models and apart from just sharing them on Thingiverse we’ve decided to create a dedicated website. So this was how the MiniRC Project was born, still new and with not that much 3D printable models available, but we are going to try to keep it updated with fresh new parts as we continue to design them. So if you are into RC models and more specifically into remote controlled cars and have a 3D printer you might be interested to take a look and keep checking the project as it continues to develop. All of the 3D printable models are free and can be downloaded and 3D printed by anyone interested, though we may add an option to order the parts already 3D printed as a means to support the project and to have them available to people that do not own a 3D printer.